Start building some bridges, and help the Fat Birds get back home! The Fat Birds have gotten themselves into some serious trouble. At first, they utterly disregarded their flying lessons, and now the evil mastermind Mad Hamster managed to destroy their airship! How can you help the Fat Birds? You simply have to build some bridges, that are substantial enough to withstand the birds’ weight! This is the only means of overcoming all this hazardous wilderness together. You’re about to embark on a trip to the Red Desert, the Caverns of the Eternal Night, the World of Snow, the Caves of Ice, and last but not least — the Everburning Tropics. All the best of luck! 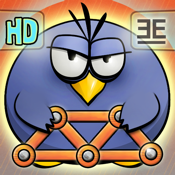 So pump up those building skills, and give the Fat Birds a helping hand!